A Norwegian startup is pushing the limits of low power in microcontrollers, cutting power by a factor of four over even 8bit devices. Energy Micro has developed the EFM32 low power 32bit microcontroller based on the ARM Cortex-M3 architecture with low power clocks and peripherals that consumes less than 180µA per MHz while executing real life code from Flash memory and the lowest active mode current consumption of any microcontroller. Its standby current consumption is also the lowest, at typically 900nA while running real time clock, power-on reset, brown-out detector and full RAM and CPU retention and less than 20nA in its deepest sleep mode. The start-up time of less than 2µs is also the industry’s fastest. 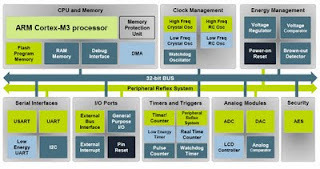 The power is lower than traditional 16 or 8bit devices from Silicon Labs, Texas Instruments and Microchip (see chart). and a UART capable of 9600bps at 100nA. One of Energy Micro’s partner customers is window maker Velux, one of the strongest brands in the global building materials and home improvement industry. It is planning to use the EFM32 in a range of contorllers later this year. Meter company Kamstrup is also looking to use the device for products next year. There are 22 different EFM32G microcontroller products which will become available over the next few months, in a variety of packages including QFN32, QFN64, QFP100 and BGA112. The EFM32G operates from a single supply rail of between 1.8 and 3.8V. The operating temperature range is –40degC to +85degC. The microcontrollers provide up to 128KB Flash memory and up to 16KB of RAM. The first products are being offered by Energy Micro in QFN64 and BGA112 profiles and are currently sampling with lead customers. Pricing for the initial 32-pin devices starts at $1.55 in 100k quantities. So, Virage Logic is taking another step towards becoming a major IP and system on chip player with a deal to acquire key IP from NXP. The deal sets up an R&D centre for Virage in Eindhoven, home of NXP, for advanced CMOS I/O, analogue mixed signal and System-on-Chip (SoC) infrastructure IP. 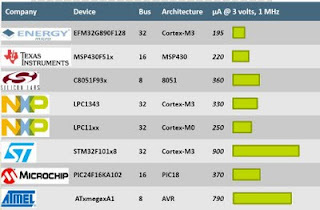 These new products are expected to be commercially available in early 2011, and sit alongside the UK-based ARC configurable processor technology acquired in August this year, creating an SoC powerhouse. Under the terms of the multi-year agreement, NXP will transfer over 160 employees and the assets associated with selected advanced CMOS libraries, IP blocks and SoC architecture along with other classes of semiconductor IP, including approximately 25 associated patent families. In return, NXP will receive 2.5 million shares of Virage Logic common stock and a share of the future revenue generated by Virage Logic from licensing the transferred IP portfolio. In addition, Virage Logic will provide to NXP services surrounding the transferred IP for a 3.5-year period, and NXP will receive a 3.5 year license to Virage Logic’s extensive standard-products semiconductor IP portfolio for all future SoC designs. For all of this, NXP pays $60m over the next four years! “Virage Logic was founded on the vision that an independent IP company could provide the technically superior building blocks the global semiconductor industry needs to develop their highly differentiated end products more cost effectively and deliver them to market more quickly,” said Dr. Alex Shubat, president, CEO and co-founder of Virage Logic. The main problem with "wireless" speakers is that they aren't - you end up replacing the speaker cable with a power cable, which can give you some advantages but really isn't the point. Now, a Bristol startup aims to provide true wireless speakers with an audio amplifier that uses just 5% of the power of traditional amplifiers. 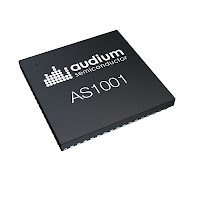 Audium Semiconductor has developed an amplifier architecture that can run for nearly a year off 4 C size batteries, with the first device, the AS1001, aimed squarely at wireless speakers. The architecture uses patented techniques to minise both fiexed power losses and output dependent variable power lossses with a low switch rate in the modulation. "Traditionally audio amplifiers have only reached quoted efficiency figures at maximum output, which is like building a city car that's only efficeint at 200mph," said Huw Davies, chief commercial officer at Audium. Altough 4 C sized batteries are still quite large, there is plenty of space in traditional speakers, giving them the flexibility to be placed anywhere in the house. With surround sound speakers there is a different challenge, as these are already small and adding the batteries would double the size of the units, but there are design tradeoffs there where styling will make a key difference. The rear surroundsound speakers also only account for 4 to 5% of the sound, so could use less batteries. The company has rasied $8.5m for the design and development of the chip in 0.18um 30V digital technology at TSMC, and is planning a stereo device for wireless MP3 docking stations, and then looking at the automotive market.